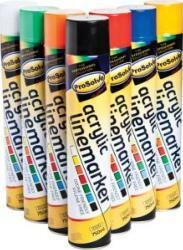 ProSolve™ Line Marker Paint is a high quality fast drying and hard wearing acrylic line marking paint which is a lead and xylene free formulation. It’s an excellent line marker for grass, concrete, tarmac, wood and composites. This line marking spray is used widely in many industries for marking, surveying, road marking, car parks, tennis courts, golf courses, warehousing and any area requiring lines for demarcation.